I have always hated my hair. And ever since I found out I was pregnant, I have been praying that he or she won't get my hair. It's thick. Too thick. And looks really really rough. If you've seen me with beautiful straight hair before, that's because it was rebonded. Anyway, although appearances shouldn't really matter, I was really thankful that Rain is born with gorgeous locks of black wavy and shiny hair. This is why I never thought of cutting it until just recently. And also because of the belief that a baby's hair is not cut or trimmed, it will be thin and will look too flat even after she grows older. So I went ahead and had her hair cut for the first time. I only had it trimmed a bit and so it wasn't really obvious that it was cut. But after a few months I decided to go all out and give her a slightly shorter hair with bangs. 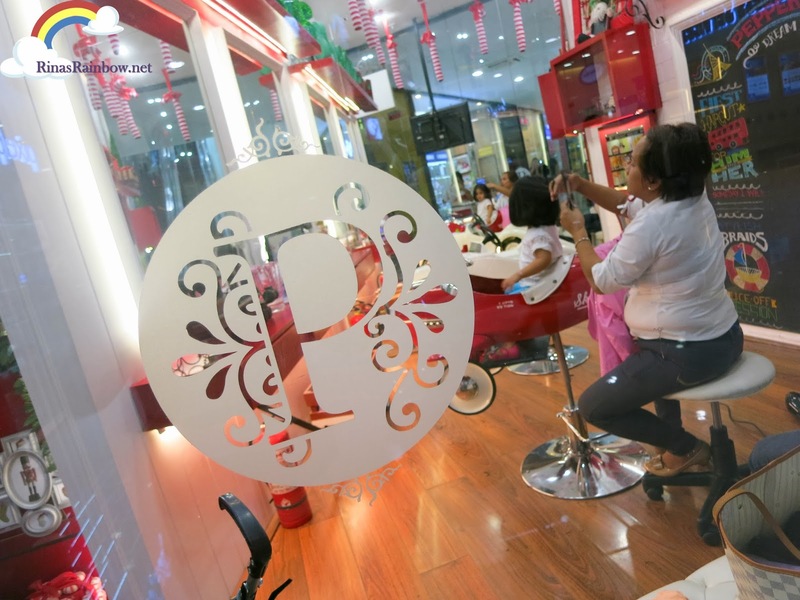 I have been eyeing a really cute kid's salon called Peppermint at SM Aura and so this time I decided to take Rain there for her second hair cut. 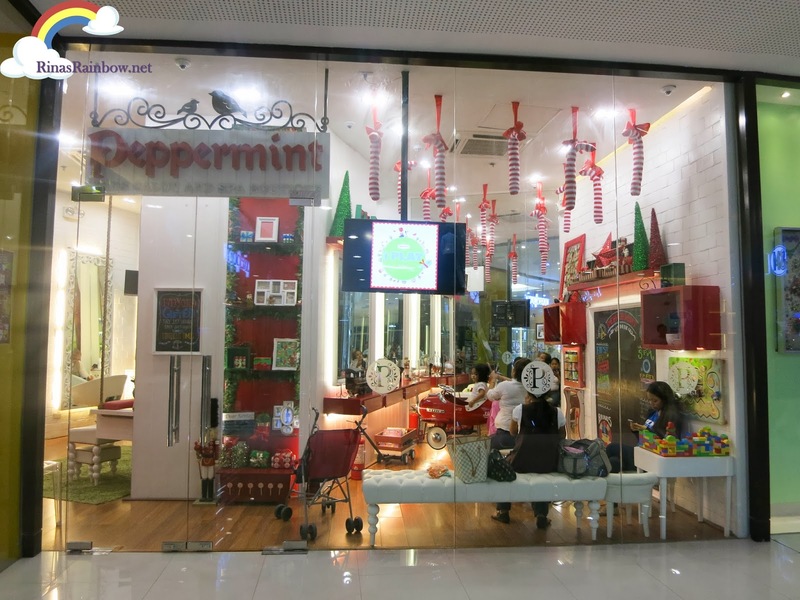 Peppermint is located at Basement 1 of SM Aura and once you pass by it, you will most likely take a second glance (if you're a mom that is). You can see everything from the outside. 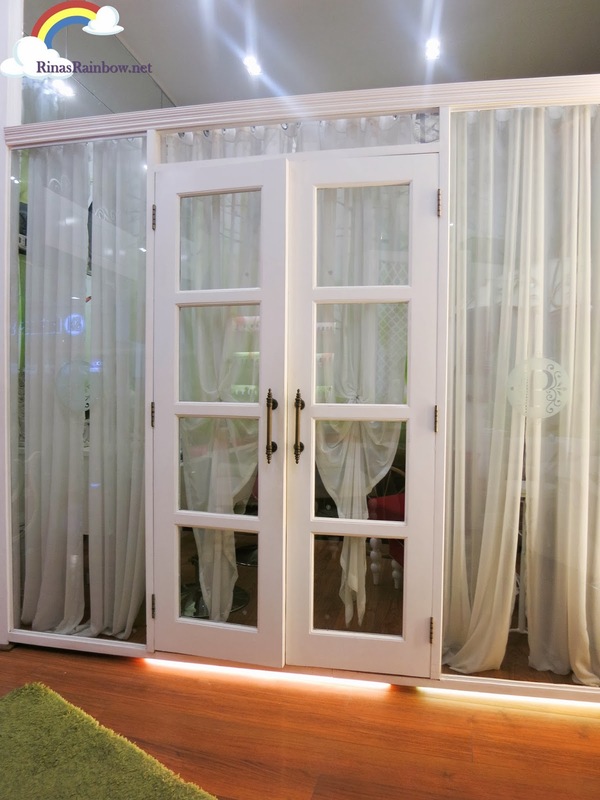 It has a dainty and vintage interior for kids. It's really pretty! 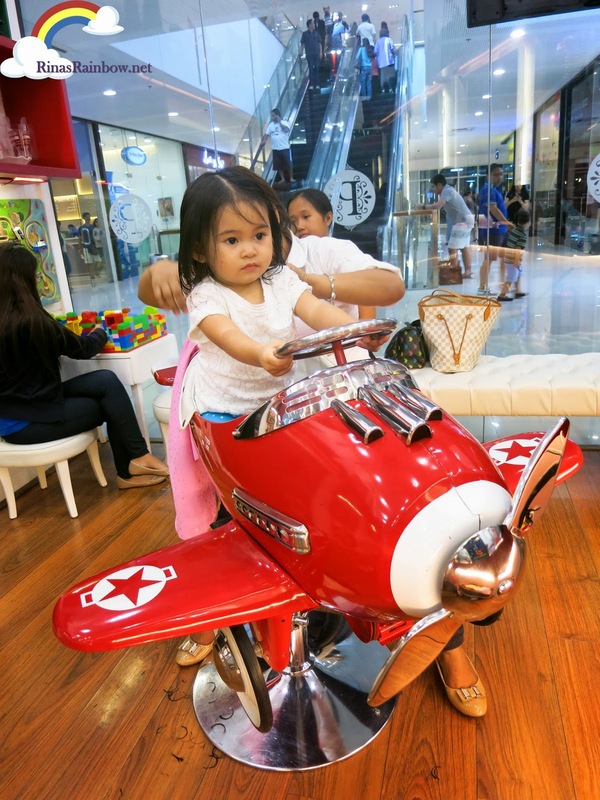 The children's chairs are of a shiny BMW, and a shiny airplane. If I'm guessing correctly, it looks like it has been made specifically for this salon. 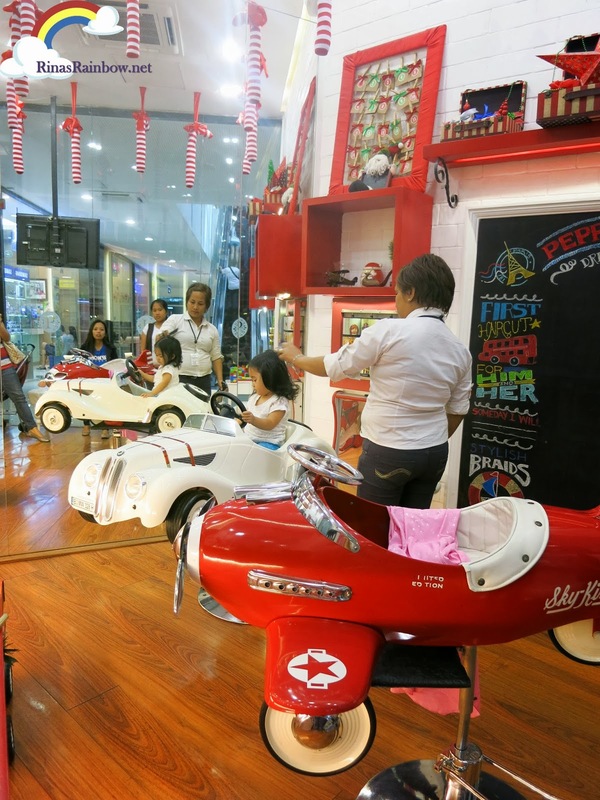 Unlike in other salons wherein the cars look like toddler's toy cars that has been installed into a chair. I first put rain in the shiny BMW. Wherein she stayed for a while but after a few minutes got a bit antsy. So after a while I transferred her to the airplane seat. But same thing happened after a few minutes. Needless to say, I was transferring her back and fourth from the BMW to the airplane until her haircut was done. Toddlers! Good thing no one else was occupying one of the seats. So anyway while she was getting her hair cut, I found a bit of time to look at the rest of the place and take pictures. 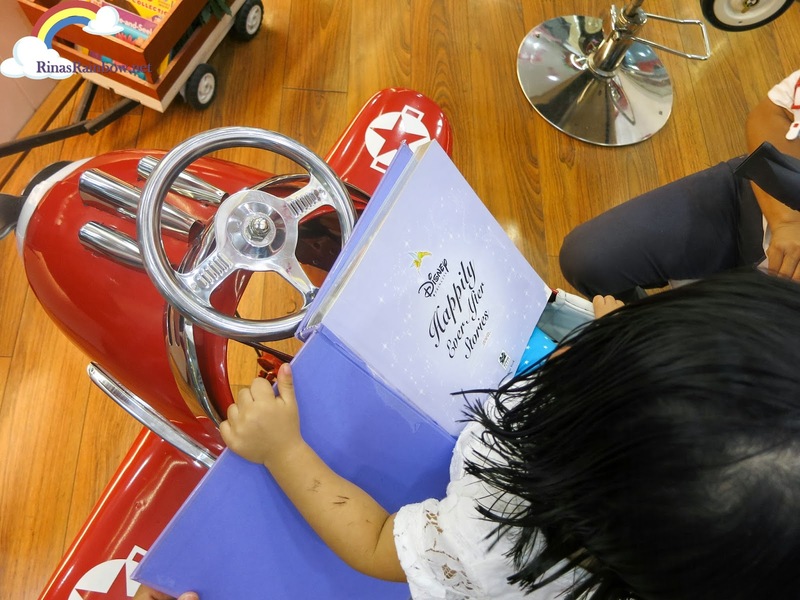 Aside from the television they also have a collection of books that children can freely borrow. Serves as a Plan B in case the television doesn't amuse the kids hehehe. 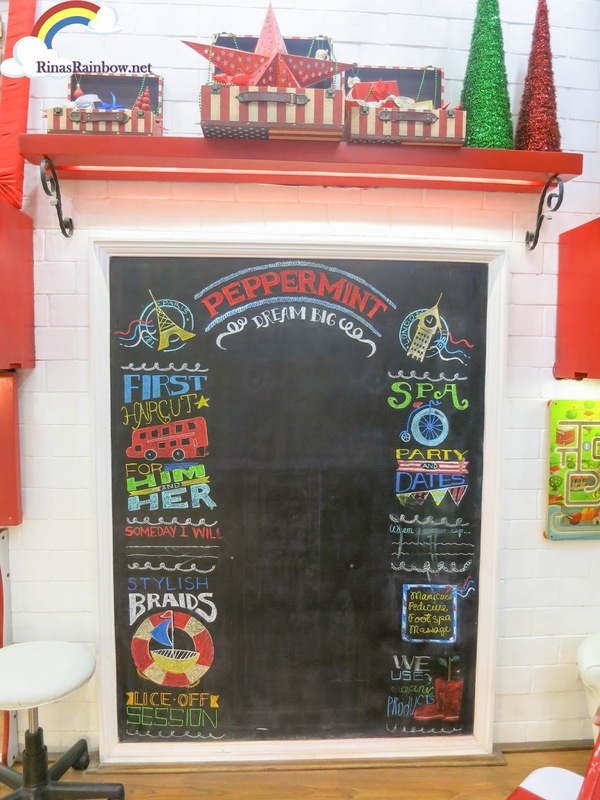 There's also a chalk board wall which I assume serves as a photo wall. 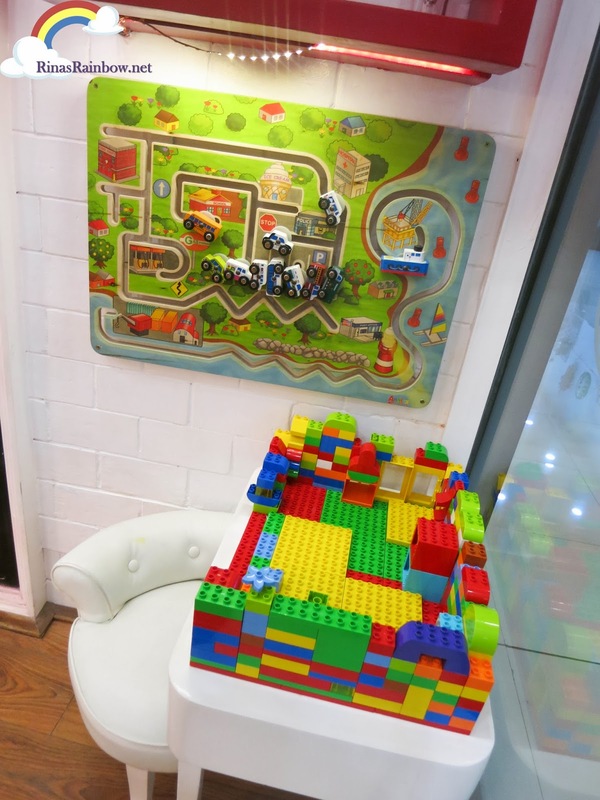 On the corner, there's a table full of Legos, and right by the wall there's a board with a picture of a town with movable cars that children can play with. 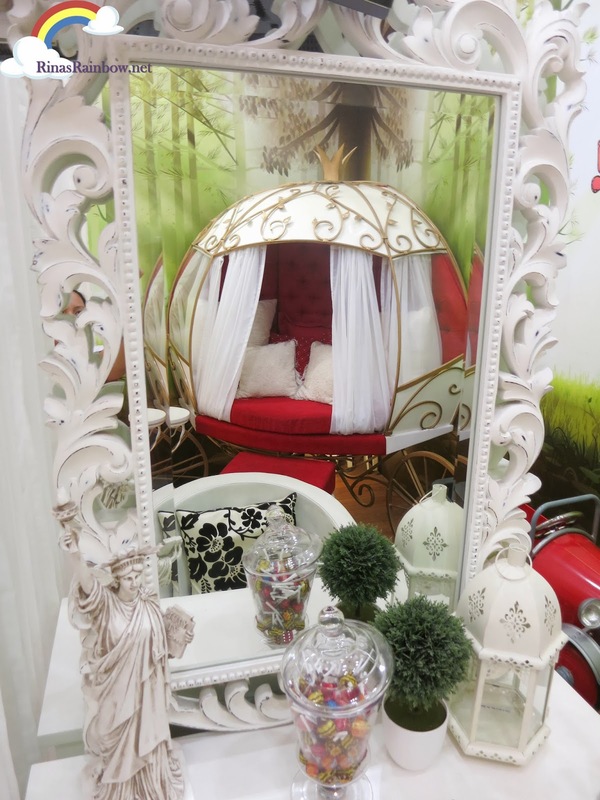 On the other side of the parlor were two dainty swing-like seats for nail polishing. Pretty! 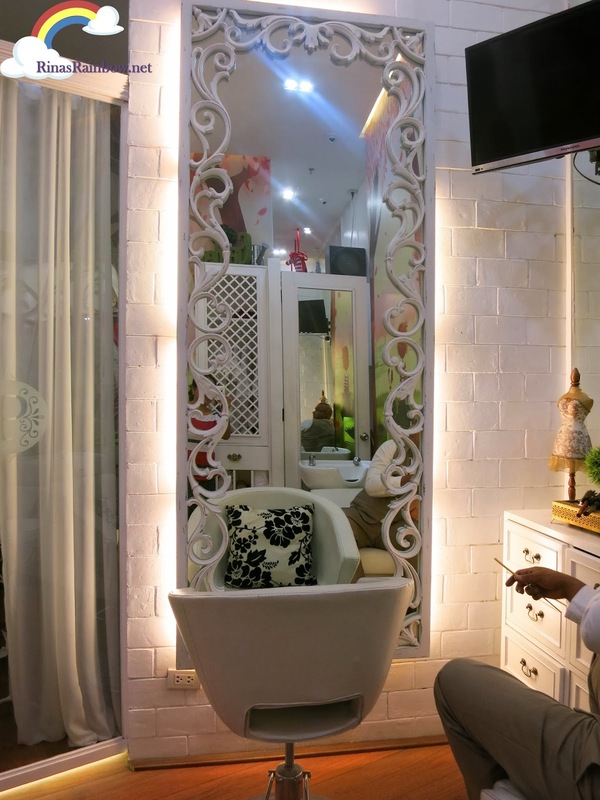 There's also a very beautiful full-length mirror where an adult or an older child can get a hair cut. .... the room is too small. There's only one dainty desk for one adult, and then beside it is a vintage jalopy kiddie chair. (Looks like Archie Andrews' sloppy jalopy hehe). But I love how the walls are painted as if you're in the middle of a magical forest! 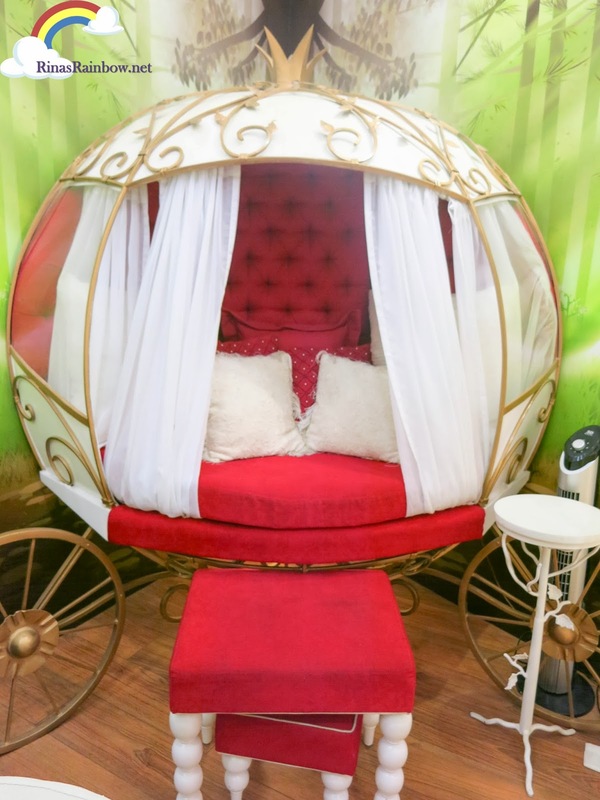 Also inside the small private room is a very beautiful carriage. Cinderella's? Most probably. 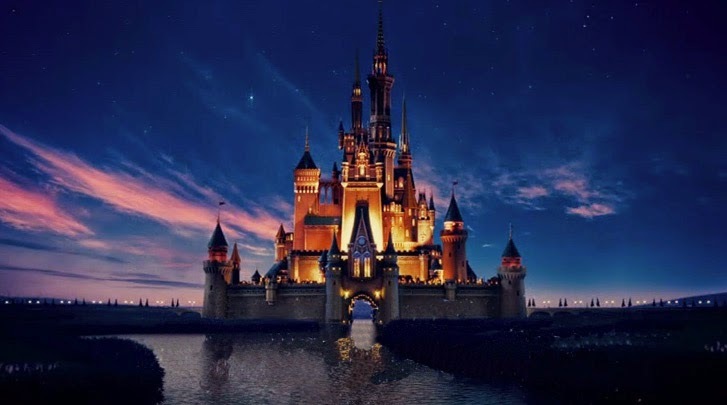 It's like being in a fairy tale! Here's another photo to give you an idea on how small the room is. Finally, Rain was done! How was the cut? Well, I'm not really an expert so I can't comment on the technical stuff in hair cutting but all I knew was she looked cute with her bangs, and its now easier to manage somehow because she doesn't have long bangs anymore that keeps bothering her face. 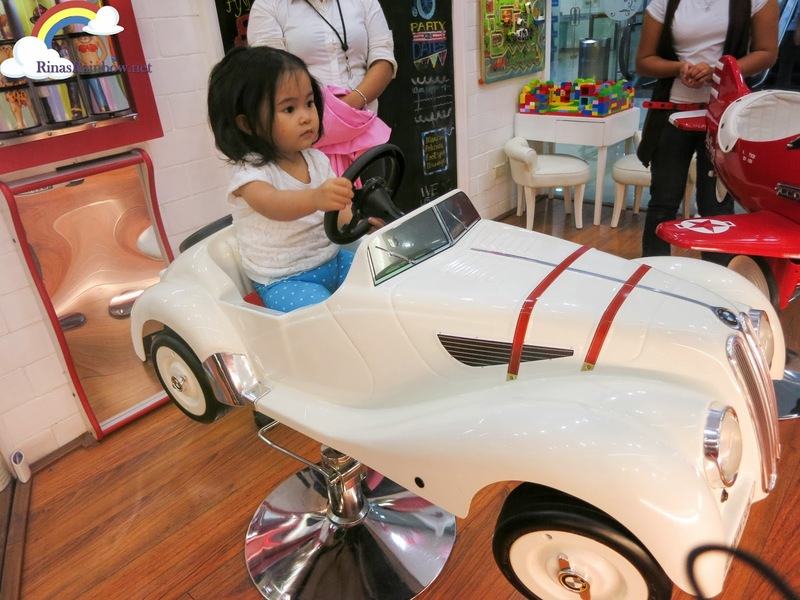 Before leaving, she had fun playing with the Lego blocks while I was paying for her hair cut :-) The price of her hair cut was P450. Personally I thought it was expensive. 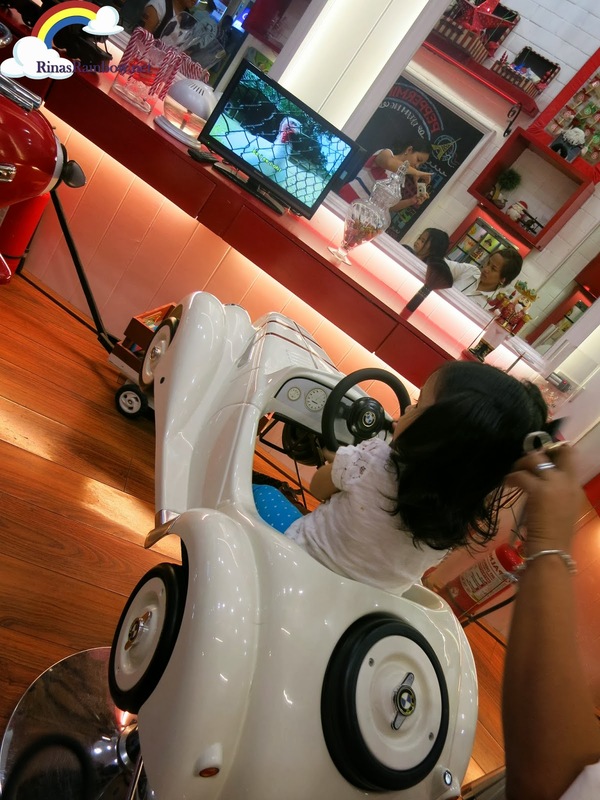 Do kiddie haircuts really cost as much? Anyway at least we got to try it! 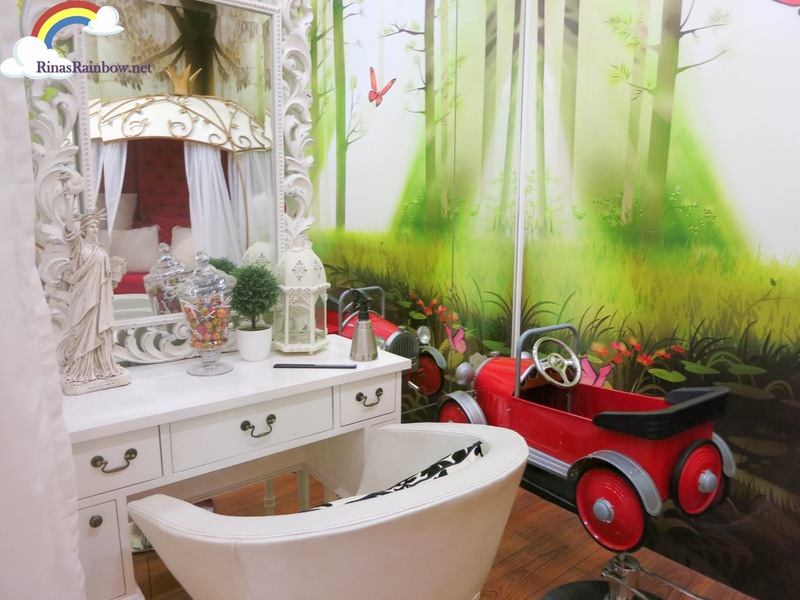 It's a fun and beautiful parlor not only for kids but for moms too! Thanks Irene! :-) if by chance destiny brings you to SM Aura, drop by Peppermint na! 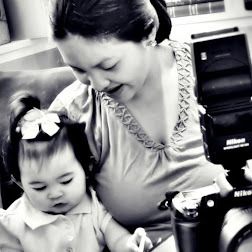 ;-) I'm sure your little one will be mesmerized! :-) like I was hahaha! Hey Rina! Macoy has also gotten a haircut there. It was a spur of the moment thing and Mark got a haircut too (we got the private room). 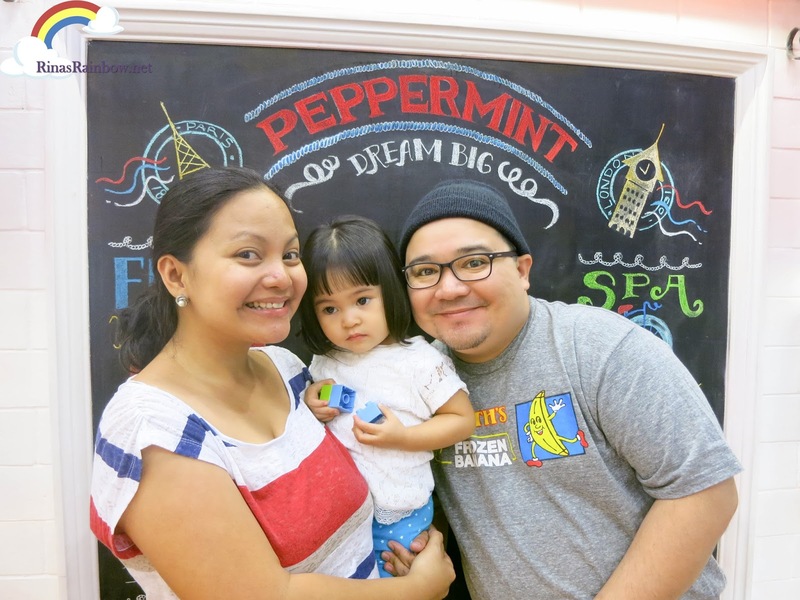 I think Peppermint looks super cute (despite the cramped space of the private room), but Macoy got his worst haircut there. He looked like a bowl was put on his head and the barber just trimmed along the sides. 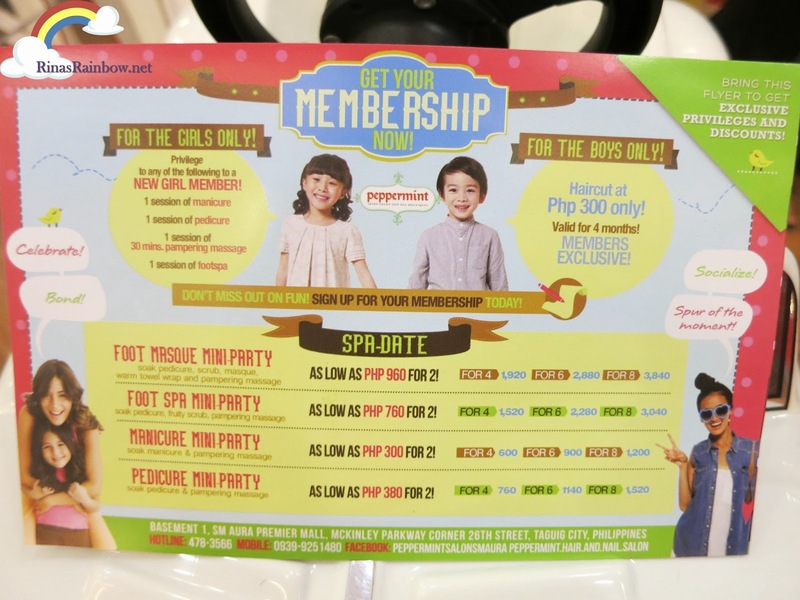 And yes their services are expensive for the mediocre quality that I saw based on Macoy (and Mark's) haircut. I'd gladly pay the price if his hair turned out GQ-ish or even like Captain America..which was his peg. But alas, no dice. Kids are naturally cute, so really, hair cuts aren't the be all end all of things. 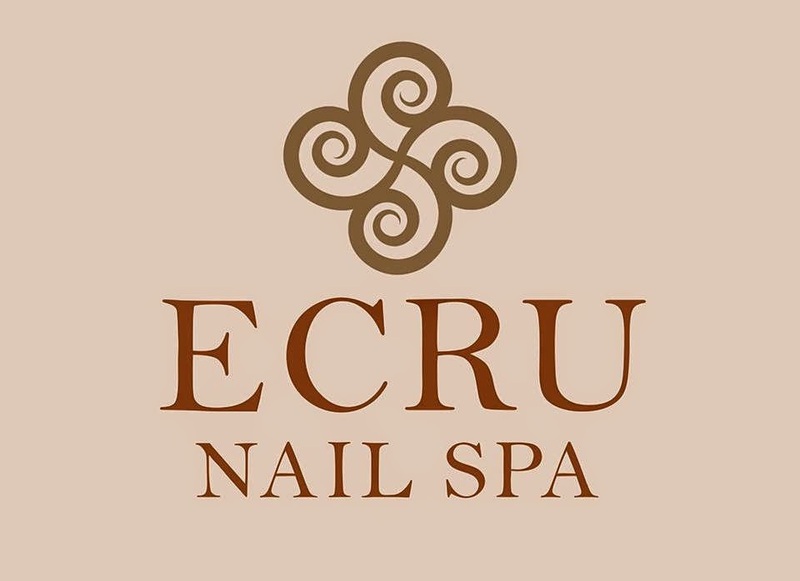 However, for the price and the quality of this place, I'd give it a pass. I wonder why up until now i still don't have my son's first haircut certificate.. 1 1/2 months of waiting is too much.. GRRRRR.. they said that it would only take 3 to 4 weeks to have that one.. already called them thrice for any update but they're just making reasons and excuses and blaming others. and it's quite irritating.. the service was good but its just they have to keep their promise..
Hi Abegail! Sorry to hear about your experience! I hope they sort it out soon! :-( You paid for that to keep as a memorabilia of your son's first hair cut :-( And if you think about it, 3-4 weeks is a long time just for a certificate :-( Thanks for sharing your experience! We also have the same issue :( It has been 2 months but still no word on the certificate.